Three properties on River Road that were affected by the flood defence wall collapse in Arundel last week have had their utilities isolated and will be warned of further flood risk, according to Arun District Council. The temporary barrier and pumps have now been removed and the roads re-opened. 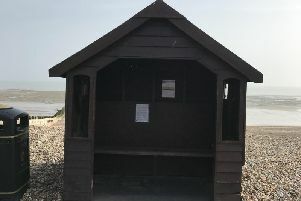 A spokesman for Arun District Council said residents have been advised to instruct a surveyor regarding the re-installation of their services. Partners are also in discussion about repairs to the private river wall and all parties are treating it as a matter of urgency. The Environment Agency’s priority continues to be that of minimising flood risk to residents and the wider community. They will continue to monitor river levels and tides and will act as the main emergency responder should properties be at risk of flooding in the future. “The council has also provided a liaison officer as a single point of contact for residents and partners and will be offering help and guidance to co-ordinate all parties involved ensuring that the recovery process is as thorough and effective as possible,” he added.